This morning I was searching for a quote related to soldiers and somehow ended up HERE…..good reading. 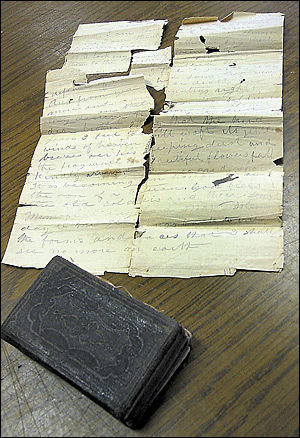 An interesting article by Eric Hartley of the Capital Gazette, Maryland, recounts the story of a man who found a letter written by his great-great-grandmother, Esther Thayer, stuck in the back of an old pocket Bible. The Bible was carried by James Thayer, one of two brothers, who left their home in Maine to serve in the Civil War. James was killed June 1863 in Cold Harbor, Virginia. The Bible was rescued by a confederate soldier who gave it to a union soldier and eventually returned to Esther. I love stories like that. During March, when Doug and I were on the east coast, I wrote a bit about Civil War sites we visited here and here. It wasn’t our first visit, nor will it be the last… can’t seem to get enough of our nation’s history. And as always, it’s the personal stories I’m searching for. How did a mother cope with war during that era? What about my grandmother during WWII? I have my own experience to draw from, but it’s hard to put in a neat little package. Esther Thayer’s letter, written after war’s end, is sweet and insightful…..
“I am thinking of my soldier boys. I am thinking of the time I parted from them and can almost feel their warm breath on my cheek as I took my leave of them. I commended them to the One whom I knew neither slumbered nor slept. I feel a just pride when I think I had sons that were brave enough to face death in defense of their country’s rights. And from year to year the soldiers are more and more honored as flowers are strewn on their silent dust. They deserve that gift. Although your brother lies in an unknown grave, I feel the kind winds of heaven will waft its gentle breezes over his sleeping dust and the fragrance of beautiful flowers will fall kindly around the sacred spot. She had me at “I commended them to the One”………..
Wow. This struck me with the thought – not only those who fight and face the enemy stand stall and brave. Those left behind must also stand and face their enemies, loneliness and grief, and stand tall and brave with faith “to feel the kind winds of heaven,” and to see “the fragrance of beautiful flowers fall kindly…” A mother has lost a son to the ravages of war, and she speaks of kindness…Wow. I know….it is amazing. I’ve read that article over several times since yesterday. Wow is right. Hope your family had a blessed Memorial Day.